Figure. 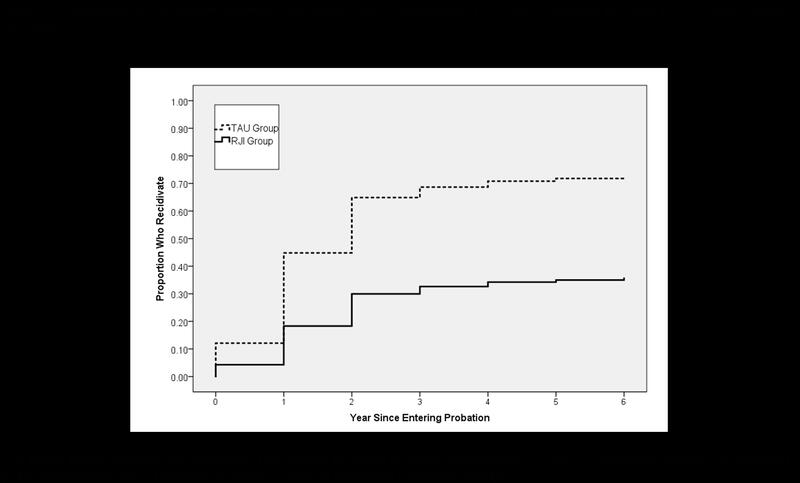 Proportion of Recidivism Between Restorative Justice Intervention (RJI) and Treatment as Usual (TAU) Group Across Six Years. Data from the Community Justice Center has been recently published in the International Journal of Offender Therapy and Comparative Criminology in collaboration with University of Nebraska-Lincoln researchers from the Department of Psychology. The study compared recidivism rates of probationers who attended a one-day restorative justice program conducted by the Community Justice Center with those who did not between 2006 and 2010. Recidivism rates were dramatically lower for probationers who attended the group compared to those who did not by the second year after the programming. These lower recidivism rates maintained across a 6-year follow-up period. Recidivism rates ranged from 30-35% for group members and 66-70% for non-group members across the follow-up (Figure above). James Jones, Executive Director of the Community Justice Center, stated, “We would like to thank Nebraska State Probation for providing us the opportunity to establish an evidence-based approach to restorative justice programing.” He also said that “with the help of grant funding and Nebraska Corrections, this restorative justice approach is currently being implemented within the prison population.” The goal is to produce similar effects as the current published work and to expand on this work by showing that increases in emotional empathy and restorative justice knowledge will be directly related to reduced offenses within prison and the reduced likelihood of returning to prison once released. “The current published data certainly supports our efforts to help with lowering recidivism among Nebraska probationers,” said Jones. This exploratory study aims to compare the recidivism rates of those that attended the Community Justice Center — Offenders Motivational/Victims Impact Class (CJC-OMVI; n = 383) versus those that did not (n = 130) after two to four years of initial contact. Simple comparisons suggest that CJC-OMVI attendees were three times less likely to recidivate (χ2 = 49.62, p < .01). Logistic regression results indicate that CJC-OMVI class attendees are still two times less likely to recidivate even after accounting for gender, age, number of felonies and misdemeanors, case management/level of service inventory scores, and procriminal and antisocial attitudes. Subsequent qualitative study of CJC-OMVI attendees indicate that over 60% show some level of empathy/insight into the effects of their actions towards their victims and communities. This study is preliminary and exploratory in nature, but the results of this study suggest that the CJC-OMVI is instrumental in reducing recidivism and increasing insight/empathy among individuals on probation.